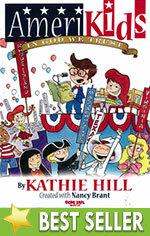 AmeriKids Patriotic : Kathie Hill Music, LLC, Making music with and for kids for over 25 years! Join the annual AmeriKids Convention in progress as delegates Yacky Doodle (Convention Chairman), Miss Dorian (Historian), Pip Squeak (from Rhode Island) and others learn about the faith that made our country great. Hear seldom-heard words from such historical figures as Benjamin Franklin, Robert E. Lee, Abraham Lincoln and George Washington, and learn of the early 18th-century AmeriKids’ faith in the Bible, in prayer, in God’s protection and in salvation through Christ. Download the 85 slide PowerPoint© with professional landscape & archival photos; Sing the States, Yacky Doodle & Armed Forces graphics; historical photos, quotes & AmeriKids logo - with page, dialogue &/or music cues from the Choral book. (download a sample below). Our school performed AMERIKIDS and loved it ! Not only was it solid musically, but the songs also provided a wonderful history lesson and CHRISTIAN VALUES as well. There are lots of opportunities to involve speakers/soloists; for me it's so rewarding to see them "grow" into their individual parts as we practice. I would highly recommend AMERIKIDS. This was great for a summer short musical! Was able to present it after 2 weeks of Summer Musical Camp. Really cute and educational, as well! I pull songs from this musical every couple of years. Have used songs from the musical for the San Diego Veterans Day Parade. It's timeless. Kathie’s Note: I love this musical! It is simple, but impressive – works really well in summer music camps - patriotic, but with humor and spiritual meat - and kids memorize Chronicles 7:14 (“If my people, called by my name will humble themselves and pray…”) plus the names of all 50 states in “Sing the States.”! Jewel cased CD with left channel instrumentation and right channel choral vocals (no dialogue or solos). IN STOCK! Contains songs, script, production notes and piano transcriptions. Limited Stock. Set of 10 paper sleeved CDs of complete musical with all song and dialogue. IN STOCK!